Hannah, left, and Nora, right, caught their first fish at Blacks Creek on Tuesday—but this baby cunner was only two inches long! Hannah swept it up in her net, not on a fishing rod, and invited her cousin, Nora, to take a look at her prized catch. After about thirty seconds of encouragement, Nora gently took the fish into her own hands. In her palm, however, Nora noticed the tiny fish struggling to breathe out of water; feeling guilty, she plunged it back into the creek, but not before I was able to snap this endearing photograph. I want to thank all of the Boston Harbor Explorers at the William F. Ryan Sailing Center in Quincy—you’re a daring bunch, never afraid to venture knee-deep into environmental exploration! 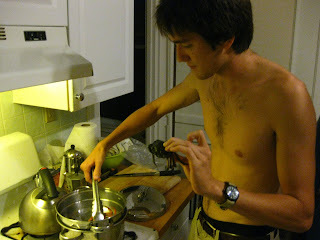 Certainly not a tiny, soft-shell Asian Shore Crab without claws! Getting Renee, a dedicated member of Save the Harbor/Save the Bay’s fishing club at Camp Harbor View, to pick up even this harmless crab took a week of coaxing and convincing. 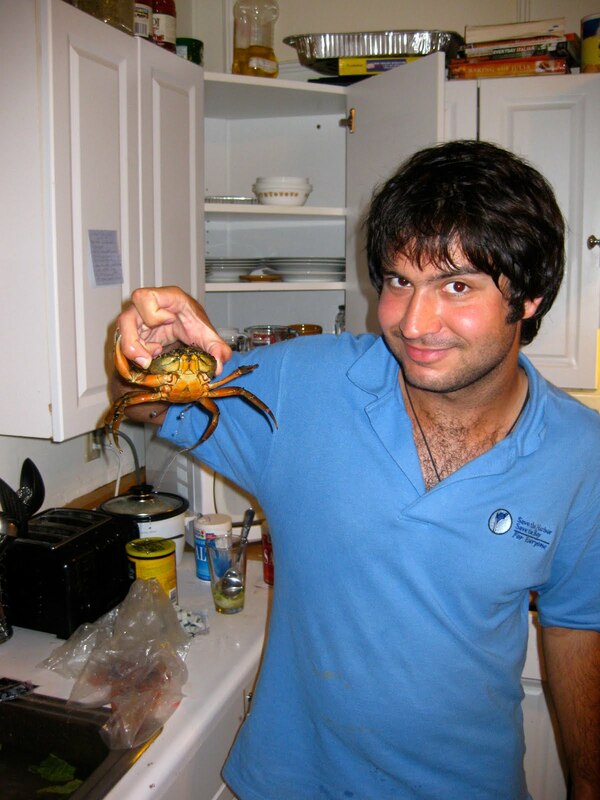 Once Renee held his first crab, however, there was no holding him back—later that same afternoon, he courageously clasped a Red Rock Crab, pincers and all! Camp Harbor View is an invaluable asset to the City of Boston, and I’m proud to have been a part of its tight-knit community for the past two weeks. 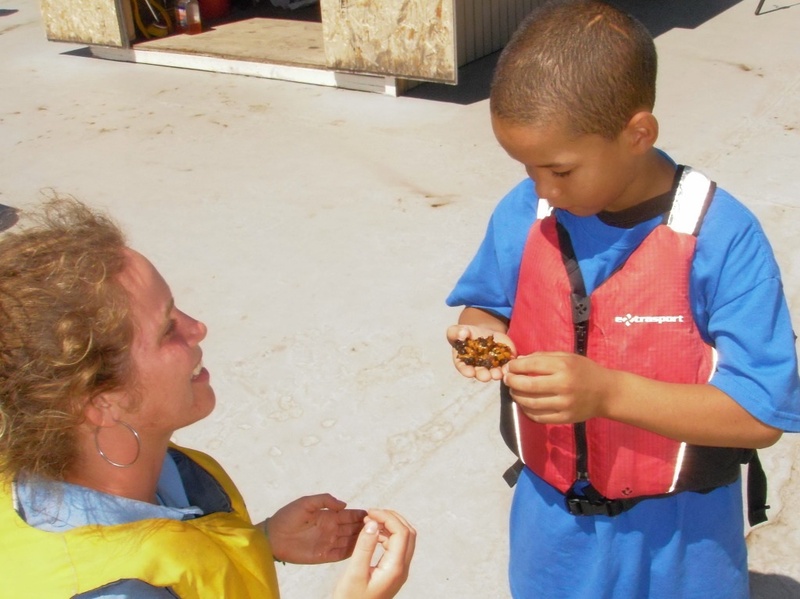 CHV brings together young people from all parts of Boston, from every imaginable background—everyone from Alejandro, a Cape Verdean whose uncle is a professional crab fisherman, to Renee, who had never seen a live crab before he peered into his first tidal pool at camp. It’s only natural, therefore, that campers’ reactions to coastal wildlife vary widely. 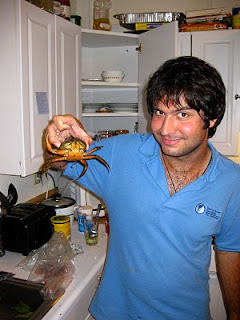 Renee, for instance, made it fairly clear that he was afraid of crabs—the fact that he jumped onto my back, screaming, when half a dozen Asian Shore Crabs scuttled out from under a rock hinted at his phobia. Renee overcame his fear, slowly and deliberately, over the course of the week he spent exploring Long Island’s rocky coast at low tide. By the last day of our session, he was confident enough to pick up the crab in this first picture—but not without a trace of his former terror! Renee’s expression captures just some of the awe that we experience, campers and counselors alike, exploring the natural beauty along Camp Harbor View’s shores. I wish Renee, and every other camper I met during my weeks at Harbor View, many more inspiring wildlife interactions in the future! On Tuesday at Blacks Creek, Aaron, Alex, Dan, and I did a scavenger hunt to help the kids identify living creatures in the water. We split the kids into four groups and went on the beach to start the hunt. 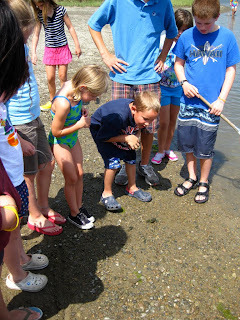 They were all excited because they love finding crabs and knowing if it was male or female. My group was scattered all over the beach to find whatever they can that was on the list. The group that won would have the pleasure of fishing. At the same time all groups were helping each other and learning as they went along. All the kids were getting along and asked each other questions. Most of the time they know the answer, but if they do not know they ask me or the other staff. 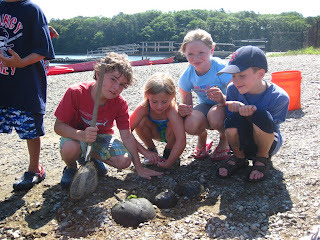 The bonus point of the hunt was to find a horseshoe crab. The kids found at least three and were amused on how it looked. They would ask questions about the tail, and how many eyes it had. They would pick it up and count how many legs it had. 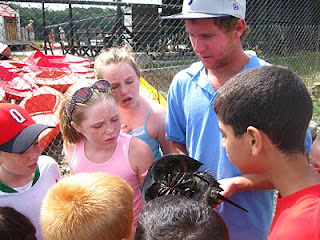 I had a girl named Mary-Kate measure the horseshoe crab she had. She named it "Bubbles" because it had small shells on it's back, and it looked like bubbles. Her face lit up when she found it and showed it to her friends. It was the capture of the week and it was a great day. Friend: "What happened to your feet??" Friend: "So do you ever take your shoes off?" 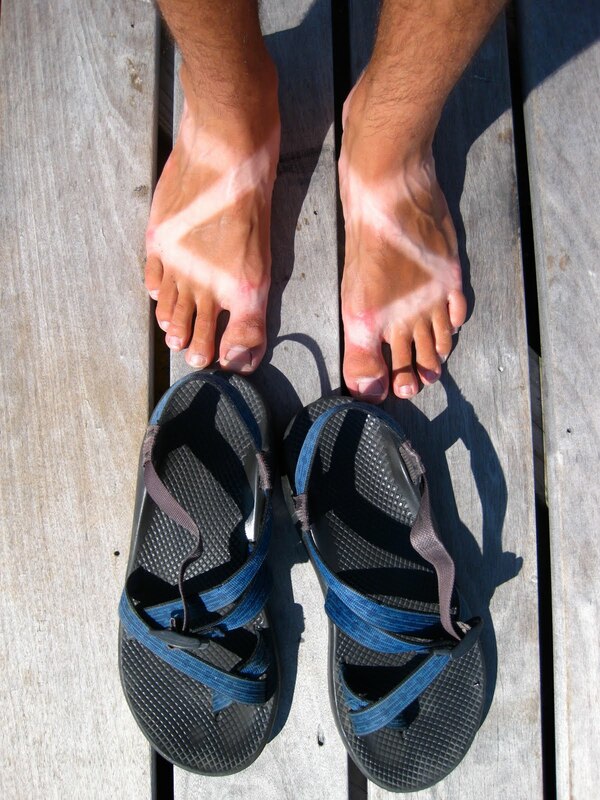 Fortunately, I love my Chacos-- not nearly as much as I love the work that I do, but my shocking strap tan is a welcome reminder of how much time I get to spend outside with my friends, both young and old, at Save the Harbor/Save the Bay. Last Friday at Courageous Sailing Center in Charlestown, and after several days of vacant attempts, we managed to pull up a lobster. It was the source of great entertainment throughout the afternoon. However, it was soon made apparent that this was not going to be your routine catch-and-release. 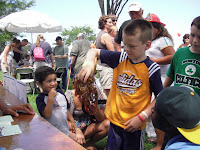 Upon zip-tying the claws shut, I was instructed to hold onto the lobster throughout the afternoon and bring it for a touch tank at The Reading Night in South Boston. I had a Dr.'s appointment at the hospital that day to get my cast off, for which I had just learned, this dear lobster would be accompanying me. This lobster was placed in a large Tupperware with about half an inch of water and put in the trunk of my car. I then drove off en route to Newton Wellesley Hospital. About 10 minutes into my drive and after aggressively weaving through Charlestown streets, I was stopped at a red light before getting onto the Mass Pike and suddenly recalled that this creature was in my car. I got out of the car and opened the trunk to make sure that it had not fallen victim to my ignorance. All was swell and I arrived at the hostpital parking in the large garage. However, unbeknown to me, this would be a long visit. In between my getting the cast off and being fitted for a splint, I decided to duck out to make sure that this lobster had not been fully boiled and cooked without anyone's intention of being eaten. It was fine but wouldn't be for long so I made the decision to drive to a Mcdonalds on Rt. 128 and casually retrieve several handfuls of ice from the vending machine. I did not even bother to explain to employees why I could possibly be doing this. I made a few trips in and out so I imagine it appeared very bizarre but I had bigger fish to fry, no pun intended. Anyway, I believe that the lobster enjoyed a relative degree of comfort over the next few hours until we arrived in South Boston at which point it would be picked up and inspected by dozens of children over the course of 2 hours. I am proud to say that my dear friend performed like a champ. He made it through the event and to my great pleasure, was able to walk away with the world ahead of him upon release. I can only imagine how he would attempt to fathom his most recent afternoon. When I woke up on July 29th I looked out the window to see cloudy skies and a pretty steady drizzle coming down. I thought to myself, well, I'm glad I'm in the office today. But then a few minutes later I received a call from Jen asking me to go out to Spectacle Island - and of course, I said yes. Though it started out raining as we got to the island the sun starting peeking out until by 12 o'clock it was hot enough to get many of the kids on the beach. I've never explored Boston, let alone the Boston Harbor Islands and it is so nice to see so many kids getting the opportunity to go out and see the sights. We took a group of kids to the sea glass beach. There we put down a large hula hoop and had the children find as much sea glass as they could in one hoop. They found more than I even anticipated. They were having so much fun dividing them into piles dependent on color, or if it was pottery. Their smiles lit up when they found a particularly big piece, or one of a color other than white. (There was a lot of white). I love Thi's drawing, I like how you don't even need to see the sea glass to understand how much fun the kids were having and how engaged they were for a least 45 minutes. I love Spectacle Island and can't wait to go back! 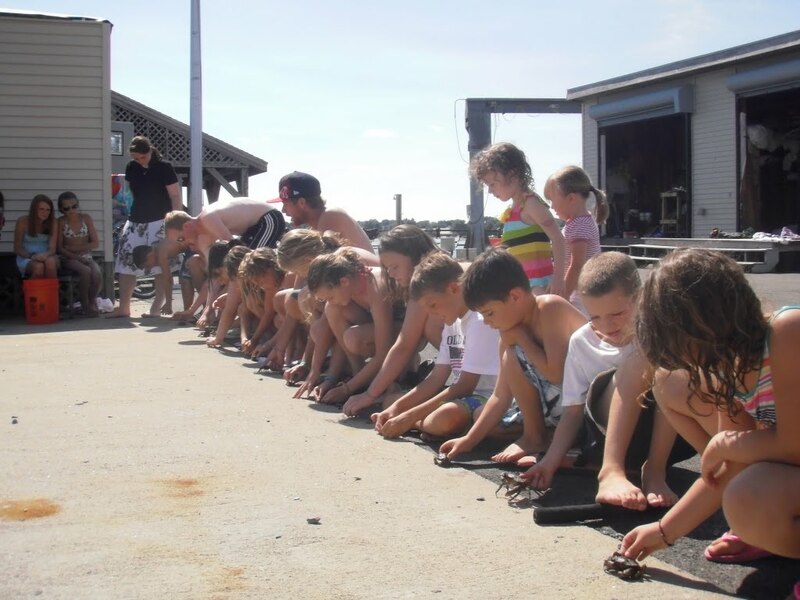 After a long day at Southie, there's no better way to unwind than with a HIGH STAKES crab race! Thats right ladies and gentlemen, we have our crustaceans return to the wild by way of a high speed race. After collecting numerous green crabs, the campers and some counselors of Harry Mcdognah sailing center each selected a crab. The goal was to have your crab start from behind a set line and then race back to the blue green waters of the Sugar Bowl. There was much discussion on whether crabs missing legs would be slower then their counterparts, as well as the question whether larger crabs would be slower. I was compelled to enter the race on behalf of a young girl who was deathly afraid of holding a crab with no claws. Thus, I took a hold of my dare devil decapod named Sea biscuit and prepared for the competition. There I was, on the line next to my rivals. Michelle's promise to pay the for the winner's soft serve ice cream from Sulley's was ringing in my ears. I started the countdown and then the crabs were off. Well, I should say some of them took off, others simply remained sitting at the starting line. Sea biscuit was ahead at first but....he chose to back pedal and blow the lead in the end. Olivia's small crab blew by the others and after attempting to fall through a crack, was redirected towards the water. Thus, the race and the fun was brought to a close with the small green crab diving of the sea wall and into its briney sanctuary. During the month of July, Save the Harbor/Save the Bay’s All Access Boston Harbor program traveled from South Boston’s Bank of America Pavilion three times a week, taking over 100 kids each day from the diverse communities around Boston on an adventure to Georges or Spectacle Island to learn about the Boston Harbor and its diverse marine ecosystem. 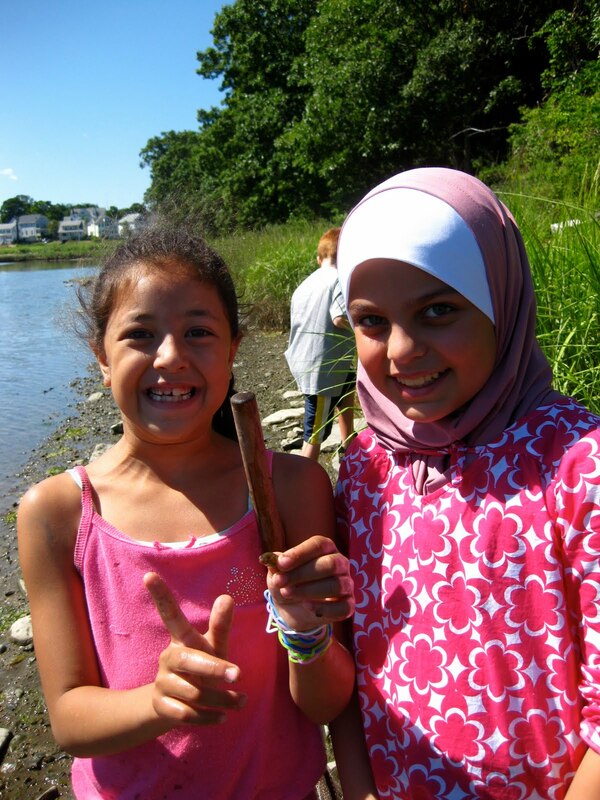 Save the Harbor/Save the Bay offers this free marine education and recreation program to over 4,000 youths and over 130 community groups for all of the Boston neighborhoods and many of the surrounding communities. 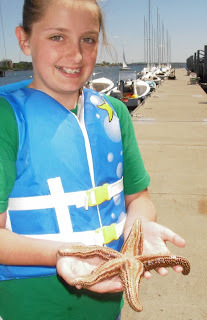 The kids and teens get to experience Boston Harbor and the Boston Harbor Islands first hand. For many their first opportunity to visit the Harbor Islands as well as take a ride on a boat and have a fun educational experience. The participants meet at Save the Harbor’s All Access Boston Harbor dockside and listen to stories from maritime historian David Coffin. He teaches the youth about the Harbor’s past and future. 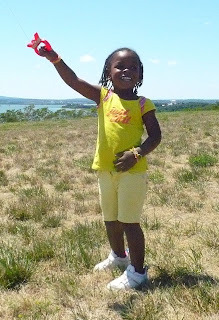 The kids then hop on the Virginia C. II for a narrated cruise to either Georges or Spectacle Island. On Georges Island the youngsters get to explore Fort Warren, a Civil War-era fort with eerie tunnels, real cannons and the haunted parade ground. Save the Harbor’s marine educators also lead beach walks and scavenger hunts for critters such as Asian Shore Crabs, Green Crabs, and Periwinkles, while teaching the young people about what it takes for these creatures to survive in a tidal habitat. 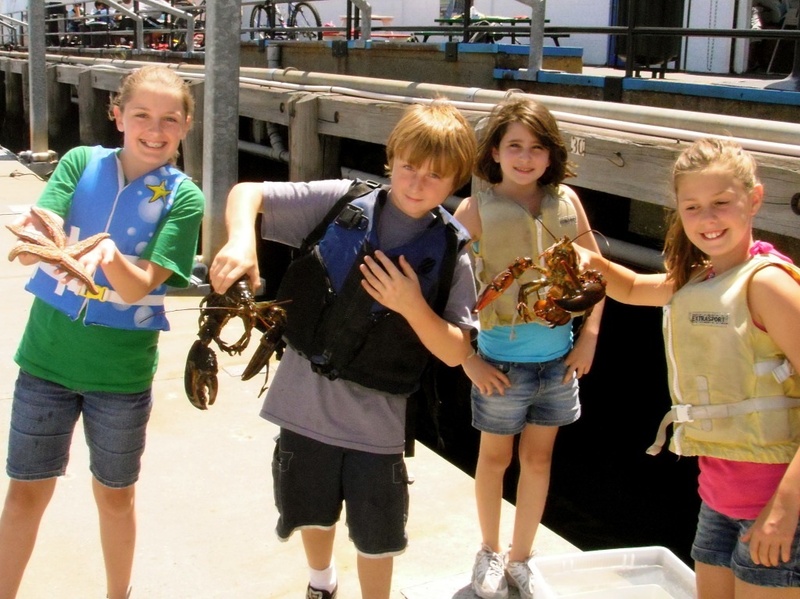 The Spectacle Island trip has a curriculum that is geared towards traditional seaside recreational activities like swimming, hiking, kite flying and fishing. Kids can fly kites, swim on the beach (staffed with a Department of Conservation and Recreation lifeguard), or can go for a hike around the island with our marine educators. 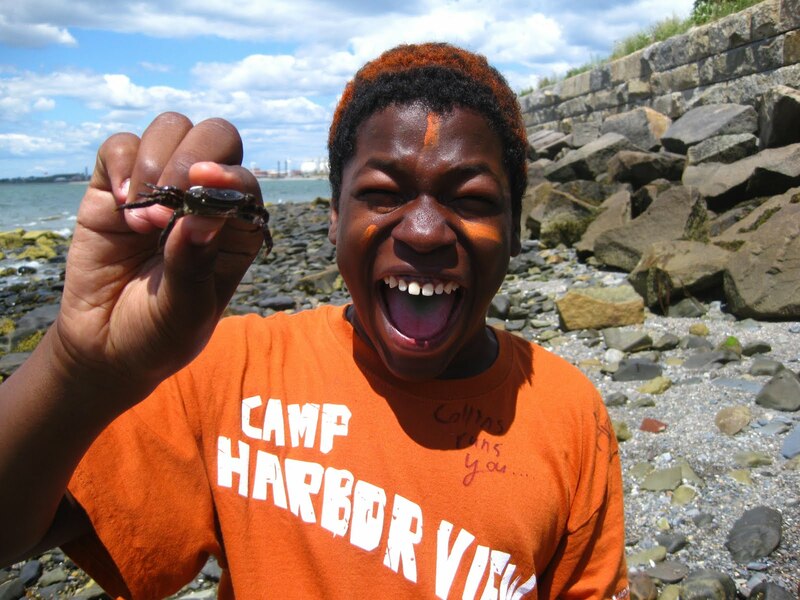 Whether chasing crabs on the shore on Georges Island or floating in the waters off Spectacle Island, youth participants in All Access Boston Harbor walk away with an experience that will stay with them for a lifetime. 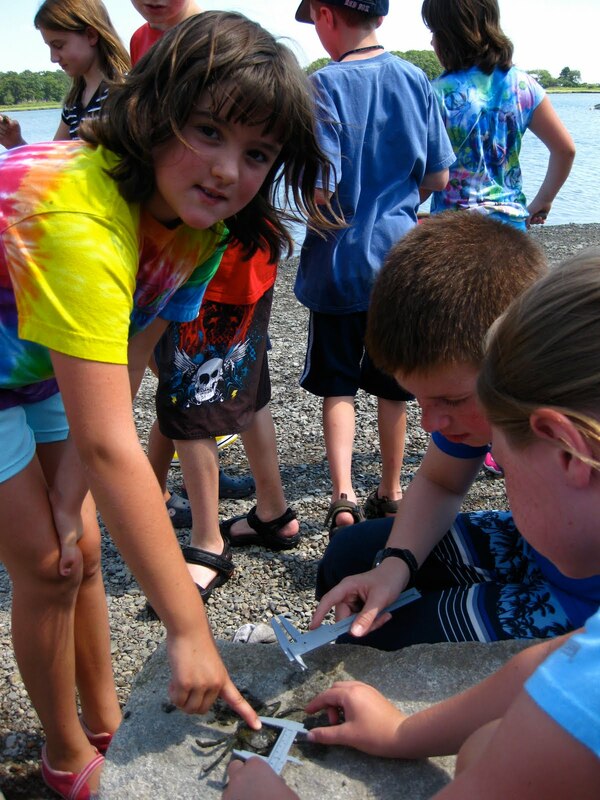 These free summer youth programs are made possible by the generous support of Save the Harbor/Save the Bay’s youth program funders; ABCD Summerworks, Arbella Insurance Group Charitable Foundation, Inc., Bank of American Pavilion/Live Nation, Clinton H. & Wilma T. Shattuck Charitable Trust, Connors Family Office, Dolphin Trust, Elizabeth Elser Doolittle Charitable Trusts, Forrest Berkley & Marcie Tyre Berkley, Friedman Family Foundation, GDF SUEZ Gas NA LLC, JetBlue Airways, John Hancock Financial Services, Inc., John S. and James L. Knight Foundation, Massachusetts Bay Lines, Massachusetts Foundation for the Humanities, Massachusetts Port Authority, National Grid Foundation, P & G Gillette, State Street Foundation, South Boston Community Development Foundation, William E. & Bertha E. Schrafft Charitable Trust, and Yawkey Foundation II. We finally caught a fish at Piers park, albeit it was not a very large one; but whatever, I'll take it!! On Tuesday, only Emily and I were staffing Piers Park as Tom was absent, but we did a great job and had lots of fun with the kids. We started the morning off with a quick game of sharks and minnows to get the kids excited and engaged. Once the sailors sailed off, we went down on the dock to catch some fish. Things were moving slow at first as we failed to get even a nibble on any of our baits. A couple of the kids decided they would try their luck elsewhere and handed their rods over to the others who had not yet gotten their chance to fish. One of the boys, named jose, called me over to assist him. I took his rod and demonstrated how to cast (perfect cast), then I handed the rod over to him to give it a shot. Using everything I had thought him, Jose threw a near perfect cast. I patted him on the back and told him "well done". 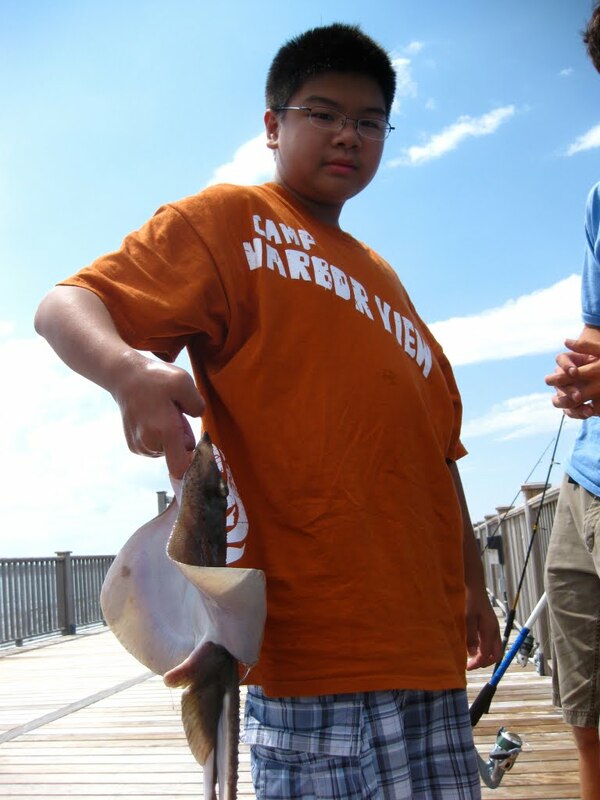 After just about a minute, Jose wheeled in his line, and at the end of it was...yes, a FISH!! Finally we had caught a fish, only the second one during my two weeks of working there, and the first one for Emily. It was a great scene as all the kids stopped what they were doing and rushed to see the fish. Unfortunately, it was not nearly large enough to keep so we had to release it. It was a great morning. A fond memory I carry with me from year to year at Save the Harbor is watching the younger youth staff take on larger responsibilities within their job title as the summer progresses. Every summer the youth staff watch and learn from the Senior Marine Educators and as the summer quickly moves ahead you will see their confidence level rise. It is a great reward as a teacher watching the students, children participating in the programs and the young youth staff take the lead on the docks. For example, Latoya and I where working at the Boston Children's Museum one day. It was just the two of us and usually I would have to delegate a job for a youth assistant in the morning, but Latoya found her role that day very quickly. She was keeping an eye out for the touch tank, making sure that if a child was interacting with it one of us was there. She was always engaging the parents and children that participated for the day. I was excited to see her confidence in teaching the young participants take shape. Watching the youth staff take on responsibility with the children at the sailing centers is a great reward. I know that the youth are finding confidence in themselves to lead education on the waterfront and take ownership of their harbor. These young stewards are working hard for us here at Save the Harbor and deserve recognition. By the end of the summer I feel confident that these young adults are ready for the work world, ready to continue their education, are full of confidence in themselves, have proven responsibility, and ready to take risks in order to give themselves a chance at life. Thank you to all my summer staff for making this happen and teaching me along the way. It has been a great summer thus far and I look forward to finishing out the summer with a BANG! This summer Save the Harbor/Save the Bay, with the support of Mass Humanities, has started a new program: The Treasures of Spectacle Island. My name is Cassandra, and I'm the Communications/Media Intern at Save the Harbor/Save the Bay. I've never written on this blog - but I'm reading it constantly and working on its formating and HTML. I'm glad I got the opportunity to go out on All Access Boston Harbor today and had a blast! As a new set of eyes today, it was my first time visiting any of the Boston Harbor Islands, I saw with wonder these treasures. I couldn't believe that this island was originally all trash. It was one of the cleanest places I've ever been - there wasn't even trash cans to smell the air up - so the air was clean and fresh with the hint of salt. David Coffin and I ventured off with a couple of kids from Jeremiah E Burke High School to look at the abundant beach glass strewn across the beach to the left of the pier. And boy, was it abundant. As David said, "You could rake the beach glass." We took the time in a certain area of the beach to see how much glass we could find. We found piles of white and green glass, as well as many pieces of pottery with old style designs on them. Harder to find was the bright blue pieces, the red pieces, and the light green. David while combing the beach actually found a record high 3 small red pieces. I also found a light green! 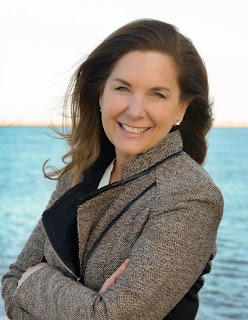 As exciting as it was and as much as I wanted to keep my discovering, we want to keep the Treasures of Spectacle Island on Spectacle Island. So I carefully placed it down back on the shore for the next person to discover. 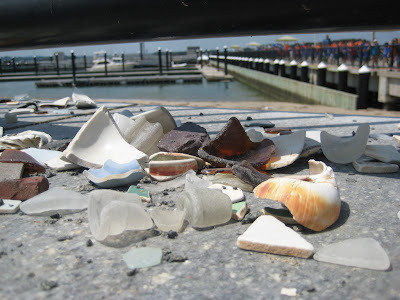 The kids of the high school were a little apprehensive of hanging out looking at glass but slowly began to enjoy themselves as they scrambled around looking at the glass as well as the crab legs and bodies, the shells, and the pottery. Even the counselors got involved enjoying themselves throughly as they combed the beach to find the best piece of glass. The best glass to find was the glass with the names on it - the ones you could tell had been an old wine bottle, or a milk "carton". We also found another gem ashore - a fellow high schoolers hat that had been blown away by the heavy winds. We ended the day with a quick swim. The waves were constant from the wind, the water wasn't too cold, and the kids had a great time. I wish I could spend everyday out in the sun! P.S. Meet "Tiger", one of the cutest kids I've ever met. So far I've been having the best summer at Save The Harbor Save The Bay. I have been at all the sites and had fun at everyone. The best one to me yet was Camp Harbor View. Its just so much excitement there for all the kids its like they can never get board. One of the best things about working with Save The harbor Save The Bay is the people I work with. Their great people and we all care about each other. Since I've been here I have connected with my staff in some kind of way. Hello everyone, hope you all had a good weekend. Today I started my second week working at Piers Park & CSC after a one week absence. We had a new group at Piers Park and I had fun getting to know them. As we waited for the sailors to leave from the dock, we played a quick game of sharks and minnows, but sadly I failed to get to base even once the whole time so I was stuck being a seaweed the whole time. So after the sailors left, we headed down to the docks where we got some fishing going. Even though we did not catch a fish, we all had lots of fun trying. After finishing up a great morning at Piers Park, we took a boat ride to CSC. I enjoyed my first week working at CSC, but based on today, it seems week 2 is going to be even more fun. We pulled up a couple of lobster traps, on one of them we caught two red-rock crabs, and on the other we found two gigantic lobsters (ok maybe not that big, but big enough to eat). Tom said he would take the bigger one home for dinner, I do not know what will happen to the less gigantic one, maybe it will get lucky and be freed. 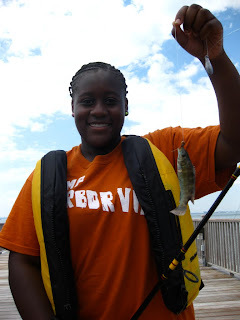 We then got some fishing done but again, we could not catch any, but it was also still fun. Soon after that the call was made for sailing, and unfortunately only two Save The Harbor staffers were needed so I had to head back to the office to do some blogging (which is also lots of fun). That was the end of another great day at work, looking forward to an even better one tomorrow. Last week Conor wrote about the prehistoric sea spider that our friend Sully found crawling through the mud at Black’s Creek in Quincy—take a look at these pictures, which give you a sense of just how strange horseshoe “crabs” are. Horseshoe crabs are so unusual to us today because they’re “living fossils,” a term that paleontologists use to describe animals that are very similar to their distant ancestors. The horseshoe crabs that we find today look the same as fossil horseshoe crabs from 445 million years ago! To put that into perspective, it took less than 6 million years for chimpanzees and humans to evolve into different species. During that same stretch of time, horseshoe crabs have hardly changed at all! Why haven’t horseshoe crabs changed? Because they’re so good at what they do. Although they’re not really crabs, like the Green Crabs or Asian Shore Crabs we see more often, they do live on the ocean floor and feed primarily by scavenging. They’re protected by a thick shell, which covers their whole body, and their tail allows them to right themselves if they get flipped over. Horseshoe crabs are built like tanks, and they’re designed so well that they’ve had no reason to change. The only threat that horseshoe crabs face comes from humans, who pollute their habitats and collect too many of them to use as bait and fertilizer. When colonists first arrived in New England, there were so many horseshoe crabs that farmers would literally use tons of them to fertilize their fields—nowadays, however, finding a horseshoe crab in Boston Harbor is a thrilling discovery. 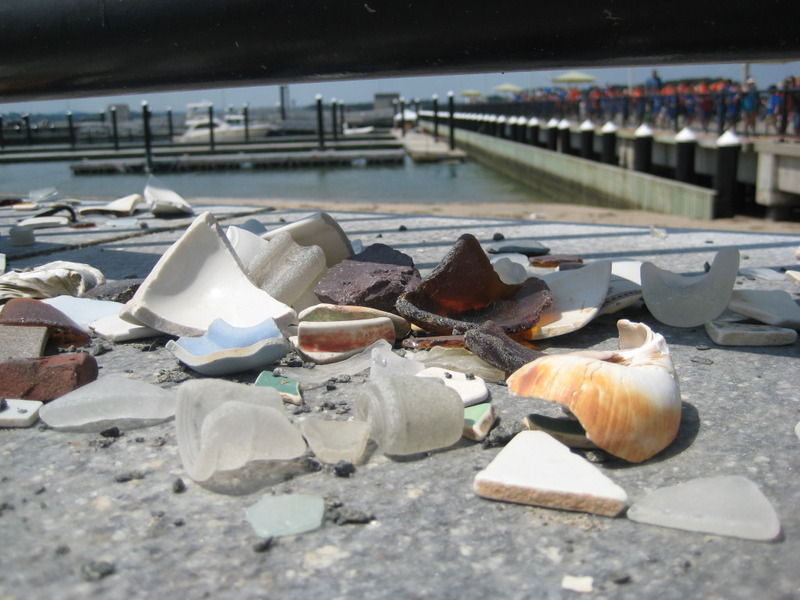 With continued dedication to cleaning up the Harbor, we can ensure that horseshoe crabs will still be around to give future generations of Bostonians a living lesson in ancient history. I got to work with the Dream Team this week- LaToya, Aruna, Tommy, and myself meshed amazingly well together, and I can't thank them enough for the passion they put in to what we were doing. Plus, I really just had so much fun with them. Thanks guys! I felt very at home working at the Boston Children's Museum, getting to talk to families and have those quick windows of time to really connect with the great kids that pass through. Practically every child that comes over to our touch tank or our lobster trap encounters something new and has this unforgettable look of awe and wonder on his or her face. I'm never going to get sick of that look. I got to work alongside Jen Last a TON this week, who, aside from providing such a great support system to our youth staff this summer, is a great role model for anyone who seeks a future in marine education. I'm incredibly lucky to be learning the ropes from her and developing my own style of teaching in the process. Thank you, Jen! My kids all week asked some amazing questions, ranging from "Is a barnacle growing on a whale the same kind of thing as if my dog had a worm?" to "I know we can't use a native spider crab for bait, we should use an Asian Shore crab... what if a spider crab was in Asia, could we use it for bait there?" It was so rewarding to see those scientific wheels turning. Combined, my sites caught 5 fish this week-- the 5th of which was a 27-29 inch striper that we reeled in RIGHT as we were starting to pack up in South Boston this afternoon. I couldn't have asked for a better final note to finish the week! For those of you who don't know, I moved here on a whim at the beginning of June. It was pretty scary to take a leap like that. I left the most important people in my life at home in Maryland, and I miss them all the time. I blindly hoped that Boston would present an outlet for my passion for environmental education, but I moved up without a job. Then Jen, Lindsay, Patty, and Bruce took me in and gave me the opportunity to be a part of this amazing group of people. It's not always easy to be 22 years old, in a new city, far away from my family, apartment hunting, trying to figure out what the next step in my life will be; but it's weeks like this that leave no doubt in my mind that I'm exactly where I'm supposed to be.